Dry to moderate moisture. Prairies, fields, pastures, roadsides, disturbed sites. Full sun. This is a 8″ to 48″ tall, erect, perennial forb that rises initially on a single stem from a taproot. When germinating from a seed the plant rises on a single erect stem and forms an underground taproot. The roots may extend up to 12′ in depth. Lateral shoots (tillers) may develop on the taproot and these become strongly ascending or erect stems. The entire plant appears grayish-green. 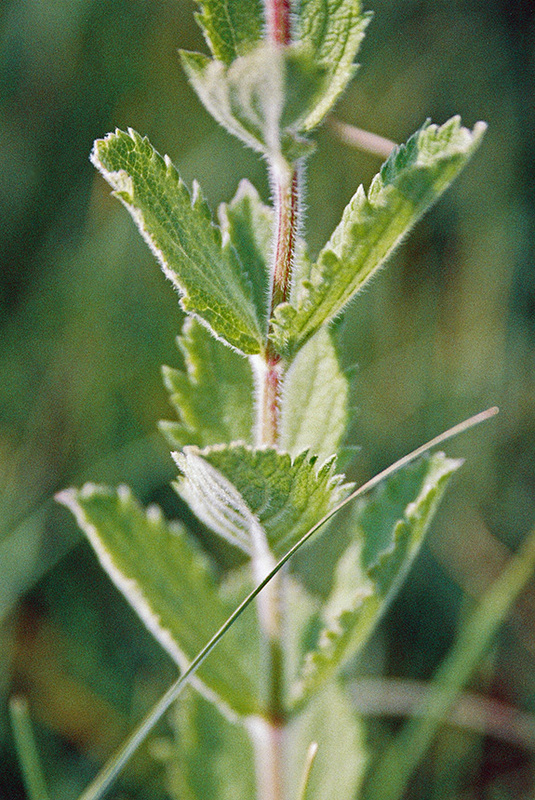 The stems are light green to reddish-purple and are occasionally branched. They may be strongly or only moderately square. They are moderately to densely covered with both long spreading hairs and shorter somewhat appressed hairs. The leaves are opposite. They are stalkless or on short, up to 3 ⁄16″ long, winged leaf stalks. They do not clasp the stem at the base. The larger leaves are thick, egg-shaped to elliptic or almost round, 1″ to 3½″ long, and ⅝″ to 2″ wide. They are usually angled or short tapered, sometimes rounded at the base, and angled or short tapered to a blunt or sharp point at the tip. They have a prominent midvein, several lateral veins that arch toward the tip, and a network of smaller veins between the lateral veins. The upper and lower surfaces are felty or rough to the touch and appear grayish. They are densely covered with both long spreading and short somewhat appressed hairs. The margins are coarsely and sometimes doubly toothed with sharp, forward pointing teeth. Upper leaves are smaller, stalkless, and lance-shaped but otherwise similar. The inflorescence is usually a solitary spike, sometimes a group of 3, rarely a group of 4 or 5 spikes, at the end of the stem and branches. The spikes are erect, 1½″ to 8″ long, densely hairy, and blunt at the tip. They are short and stout when young, greatly elongated and slender at maturity. 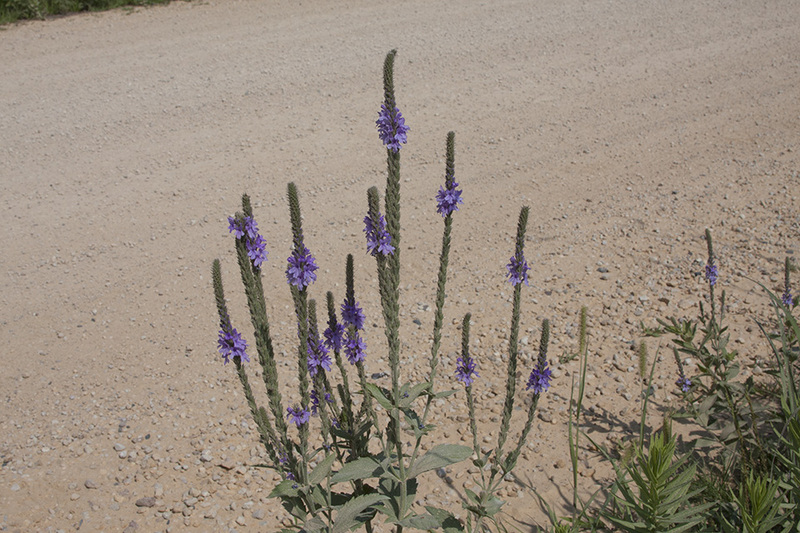 The flowers are densely crowded and spirally arranged on the spike. They bloom from the bottom up and only one to a few complete rotations of the spiral are in bloom at any one time. Each blooming flower overlaps adjacent blooming flowers. Each flower is ⅛″ to ¼″ in diameter. There are 5 sepals, 5 petals, 4 stamens, and 1 style. The sepals are green, and are united at the base into a narrowly bell-shaped tube (calyx), then separated into 5 short teeth that are unequal in length. The calyx is ⅛″ to 3 ⁄16″ long and densely hairy. The modified leaves (bracts) at the base of each flower are narrowly lance-shaped, sharply pointed, and 1 ⁄16″to ⅛″ long. They are slightly shorter to slightly longer than the calyx. The petals are purple to purplish-blue, rarely pink or white, and ¼″ to ⅜″ long. They are fused at the base into a slender, funnel-shaped tube then separated into 5 spreading lobes. The lobes are ¼″ to ⅜″ in diameter and blunt and rounded at the tip. Each flower produces a cluster of 4 nutlets that are enclosed in the persistent calyx but are exposed at the tip. Each nutlet is narrowly oblong in outline and 1 ⁄16″ to ⅛″ long. They are finely ridged on the bottom and have a network of raised ridges on the top. The taste is bitter and unpalatable to cattle. 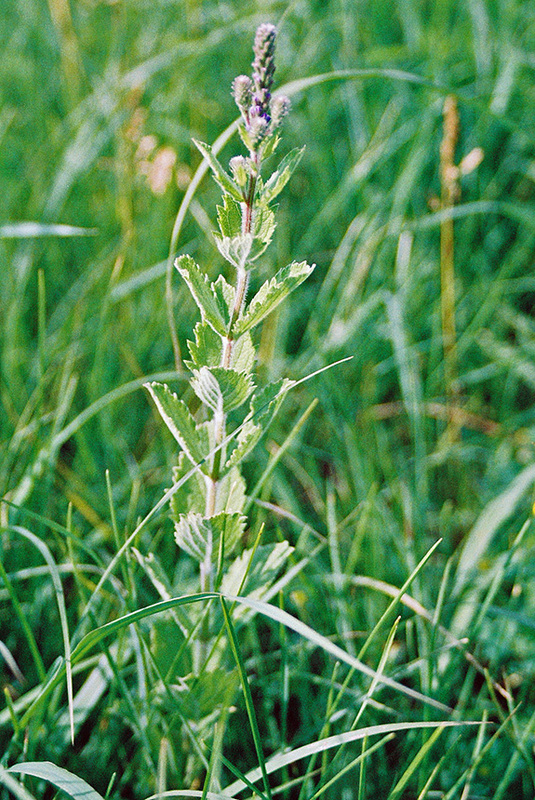 As a result, this plant is common in overgrazed pastures. 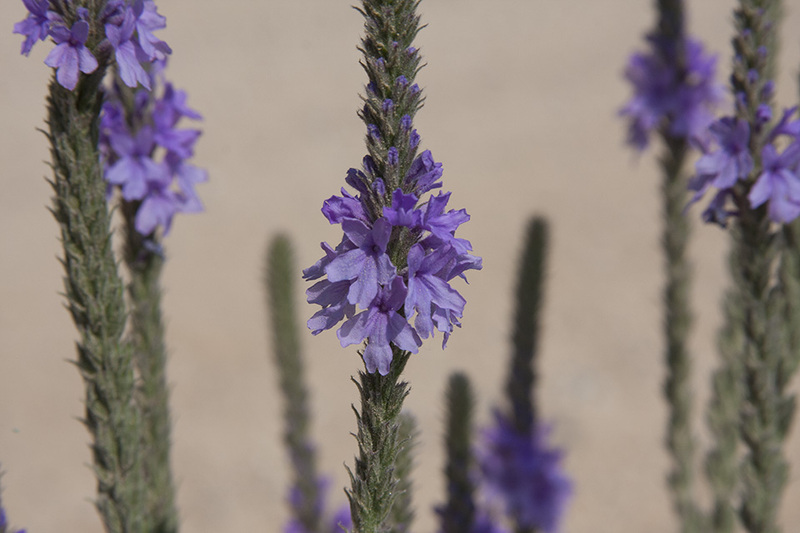 Vervain tends to grow in sunny locations and are available to harvest when the plant begins to flower, usually in the warmth of summer.